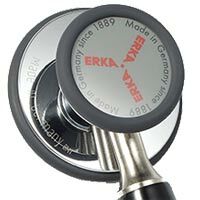 A dual-head stethoscope that is a switchable chest-piece for auscultation on both adults and children. Both sides are designed with a prestressed convex diaphragm for brilliant sound transmission and resonance. Featuring two super soft sets of ergonomic ear tips for perfect sealing out of background noises. Dual-head chest-piece with 2 convex diaphragms. Highly glossed polish, featuring a non-porous, chrome-plated brass chestpiece. 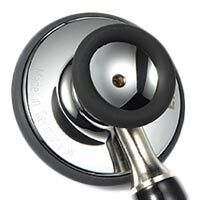 Ideal for all specialties. The universal standard. Love it except the small ear pieces came off my first day of xlinicals. Love my new stethoscope! I can hear much better than I could with my Littman. Have received a lot of complements! I love the fit and material of these scrubs. I would only buy more if they came in more styles. I have to wear Navy and I really don’t want multiples of the same exact scrubs. Great, if difficult to get used to at first. I bought this after I thought I lost my Littmann Cardio 3. It's a really great and sturdy stethoscope (it lives in the case it came with, in my work bag), but it's still taken some time to get used to applying different pressures to elicit different sounds--I guess that's the traditional stethoscope and I'm a bit spoiled. The ears require some adjustment too, and I still haven't dialed that quite in yet. 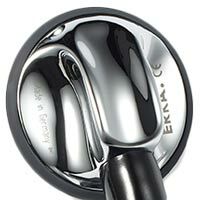 Q: Does the finesse 2 give you the option to use the smaller side as an open bell like the Littmann III? Yes, the Finesse2 has a combined chest-piece with two membranes for a full and perfect pre-amplified range of frequency with adults and children.